FLASH: 4:47 a.m. EDT August 28 — Indian e-voting researcher Hari Prasad was released on bail an hour ago, after seven days in police custody. Magistrate D. H. Sharma reportedly praised Hari and made strong comments against the police, saying Hari has done service to his country. Full post later today. 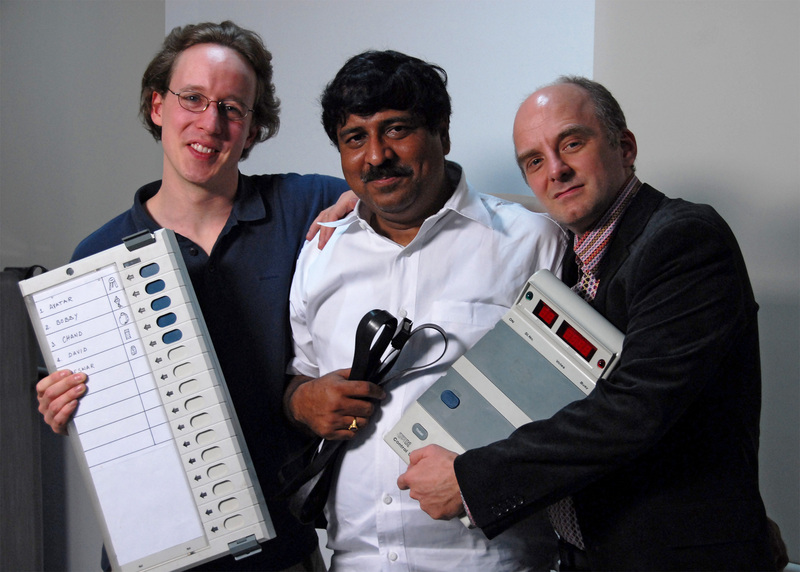 In case you’re just tuning in, e-voting researcher Hari Prasad, with whom I coauthored a paper exposing serious flaws in India’s electronic voting machines (EVMs), was arrested Saturday morning at his home in Hyderabad. The arresting officers told him they were acting under “pressure [from] the top,” and demanded that he disclose the identity of the anonymous source who provided the voting machine that we studied. Since then, Hari has been held in custody by the Mumbai police and repeatedly questioned. There have several developments in Hari’s case since my last post. On Sunday, about 28 hours after his arrest, Hari appeared before a magistrate in Mumbai and was formally charged for the first time. The officers who arrested him had not stated a specific charge, but they had told him he would be left alone if he would reveal the identity of the source who provided us the machine . Hari has not named the source, and the authorities are now alleging that he took the machine from the government’s warehouse himself. Specifically, he was charged under Section 454 of the Indian Penal Code (“lurking house-trespass or house-breaking in order to commit [an] offence punishable with imprisonment”), Section 457 (“lurking house trespass or house-breaking by night in order to commit an offence punishable with imprisonment”) and Section 380 (“theft in [a] dwelling house”). These charges are without merit. Hari has never denied having been in possession of a machine—we even held it up for a photograph to accompany our paper—but the police have offered no evidence whatsoever that Hari ever trespassed in a government warehouse, much less stole a voting machine or anything else from one. As I have previously stated, Hari obtained access to the machine from a source who approached him earlier this year. We have every reason to believe that the source had lawful access to the machine and made it available for scientific study as a matter of conscience, out of concern over potential security problems. At Sunday’s hearing, Hari was remanded in police custody until today, when he appeared again before a magistrate and requested bail on medical grounds. (He is reported to be suffering from breathing problems.) The court refused to entertain the bail request and instead granted a police request that Hari remain in custody. The next hearing is scheduled for Saturday, at which time Hari can again seek bail. One positive development is that Hari’s legal team now includes Mahesh Jethmalani and his father, Ram Jethmalani. I am told they are among the most sought after defense lawyers in India. Hari’s arrest has provoked explosive debate in India, not only about the arrest’s apparent political motives, but also about much broader questions our study raised over the security and transparency of India’s voting system. In the midst of this emotionally charged debate, I think it would be helpful to reiterate what our study does and does not reveal. First, far from being “tamperproof,” India’s EVMs are vulnerable to most of the same security problems as the paper ballots they replaced—including an electronic form of booth capturing. Any time during or after the election, dishonest election insiders or other criminals with physical access to the machines can alter the votes stored inside. Second, unlike the old paper ballot boxes, the EVMs can be tampered with long before elections take place to cause fraudulent results in the future. In other words, a dishonest insider or other criminal could manipulate an EVM today and have it steal votes months or years from now. You can’t do that with a ballot box. What our study doesn’t show is that any election has ever been stolen by tampering with EVMs. Today’s EVMs are susceptible to tampering, and such tampering has the potential to change results in national elections, but our study does not even attempt to show that any past election result is invalid. Nobody can reasonably claim, based solely on the results we’ve presented, that an election now settled should be overturned. Now that we know that EVMs have these vulnerabilities, it’s time for the Election Commission of India to stop pretending that the machines used today are perfect, and start working with India’s academic and technical communities to create a voting system that is worthy of voters’ trust. So which voting system should India use? That’s a question for the nation to decide based on its own circumstances, but it appears there is no simple answer. The EVMs have problems, and old-fashioned paper ballots have their own problems. Despite noisy claims to the contrary from various sides, showing that one is imperfect does not prove that the other must be used. Most importantly, the debate must recognize that there are more than two approaches — for example, most U.S. jurisdictions are now moving to systems that combine paper and electronics, such as precinct-count optical scan systems in which the voter marks a paper ballot that is immediately read by an electronic scanner. Whether a similar system would work well for India remains an open question, but there are many options, including new approaches that haven’t been invented yet, and India will need to do some serious analysis to figure out what is best. To find the best voting system for India, the Election Commission will need all of the help it can get from India’s academic and technical communities. It will especially need help from people like Hari Prasad. Getting Prasad out of jail and back to work in his lab would not only serve justice — which should be reason enough to free him — but would also serve the voters of India, who deserve a better voting system than they have.